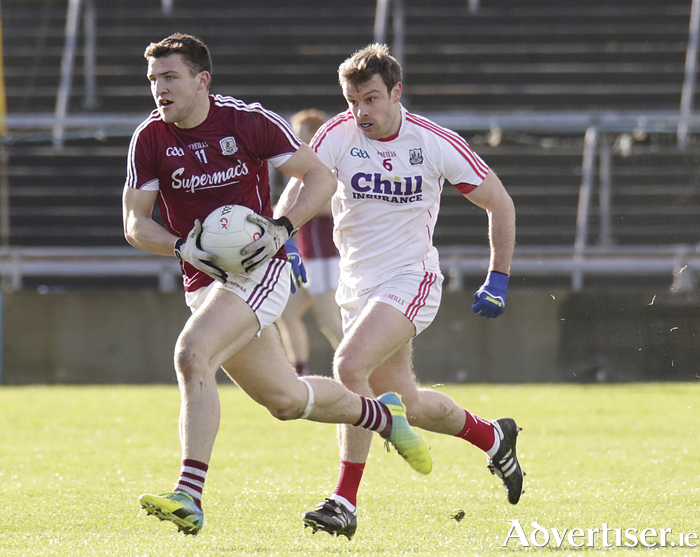 The Galway senior footballers are on the road this weekend when they face Fermanagh in Brewster Park (2pm ) on Sunday. Pete McGrath's charges will be hard beaten and they had an impressive and efficient 1-16 to 0-10 win over Down last weekend in Páirc Esler in Down. Fermanagh are very well organised outfit and Kevin Walsh's team drew with them last year in Tuam Stadium by 0-15 apiece. All the Galway players involved in that clash will know the Erne men are tough and they play to a plan and have an impressive work-rate all over the field. Their main forwards are Tomas Corrigan, who hit 0-8 (7fs ) against Down, Eoin McManus at centre-forward, and the robust Sean Quigley on the edge of the square. Other good players Galway will have to nullify this weekend are wingback Aidan Breen, who scored 0-2 last Sunday, and centre-back Ryan McCluskey, who is a good ball player. Eoin Donnelly at midfield is a top-class player too and the Cullen twins are also solid men. Galway will most definitely need to improve on their 0-14 to 1-11 draw played out with Cork in Pearse Stadium last Sunday if they are going to win in Fermanagh. Galway were poor enough in the first half, and were 1-3 to 0-5 behind at half time. It could have been a lot worse, as Cork hit nine wides in that 35 minutes, and Rory Lavelle had to make a super save off Aidan Walsh to stop a second goal. Galway improved a good bit in the third quarter and went into a three-point lead following good scores from Barry McHugh (2fs ), Danny Cummins and Paul Conroy. Unfortunately some inane defensive mistakes gave the initiative back to Cork and they rallied with Colm O’Neill making a really big impression on his introduction. However, it was his miss from a free in injury time that left Galway with a point in the bag. There were positives from the game and a big plus for the Galway management team was the encouraging impact that Michael Daly made on introduction. His catching ability, pace, penetration and range of passing really livened up the Galway attack and he needs to get a lot http://10.0.1.202:8080/uploads/00025900/25925_thumb.jpg more game time this Sunday. Cillian McDaid also caught the eye when he came on and Cathal Sweeney hit a gorgeous point too. The free taking of young Barry McHugh was top class, but he will need to have more of an impact from play over the coming few weeks. Clonbur’s Declan Kyne once again showed great heart and tenacity and his ability to break out through the tackle with ball in hand is something a few of his teammates could use as a template rather than going laterally all the time. If Galway attack the game and really go for it, they can get a win. However the error count has to drop drastically, and that is something the players will have been told this week.